Throughout a sold out amphitheater tour in summer 2018, Weezer began working covers into their set, ranging from “Take On Me” by a-ha to “Happy Together” by The Turtles, in addition to their massive cover of “Africa” by Toto, which became a viral and radio sensation upon its release earlier that year. Given the tremendous response to these songs at the shows, the band was inspired to put together a covers album — and thus WEEZER (THE TEAL ALBUM) WAS BORN! Surely a high light for anyone who attended Weezer’s summer tour which featured the band intermingling their own list of hit songs with classic rock staples such as Black Sabbath “Paranoid” and the new wave esque “Take On Me” all set against a bombastic stage show complete with fire, lights and a boat…Yes a boat! Well for fans that really enjoyed the live experience of those songs they now have the chance to own what is being dubbed “The Teal Album”. The album features all the covers heard on this summer’s tour in studio form along with a handful of other songs that will take listeners back to their younger years. From The Eurythmics hit “Sweet Dreams (Are Made of This) and Michael Jackson’s “Billie Jean” to TLC’s “No Scrubs” the ten song collection covers a number of musical era’s and genres. Though I would have liked the band to put a little bit more of their own spin on the tracks instead of sticking to the songs original sound they album was still an enjoyable listen. If you were the guy or girl who couldn’t go with your friends to see Weezer when they were in town who in turn got stuck listening to all the stories about what you missed, you can now get somewhat caught up and at least hear the music. 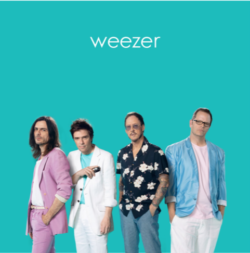 Weezer’s “The Teal Album” is a solid listen and the perfect album to tide you over until the March release of the bands new studio album (queue the Spinal Tap jokes) “The Black Album” which we be released March 1st followed by a Co-headlining tour with The Pixies starting March 8th in Louisville, KY.